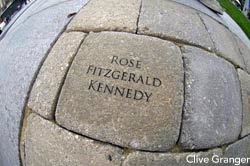 Join the Aquarium and the Greenway Conservancy in celebrating Rose Fitzgerald Kennedy's birthday this Thursday, July 22! Events throughout the day center around the story Rose's Garden, by Peter H. Reynolds. Rose's Rolling Teapot, a replica of the illustration in Rose's Garden, will be stopping at various locations along the Greenway District from 11:30 am to 5 pm. Stops include the Aquarium, the Rings Fountain, the Farmer's Market near South Station and more! The cart will start the day at the Children's Museum at 11:30 am. At 1 pm, come down to the Aquarium to make paper flowers to add to the teapot! The celebration will culminate in the North End Parks with family-friendly activities including a participatory art project, storybook reading, lawn games and food between 3 p.m. and 5 p.m.
Can't join us on the Greenway? Peter Reynolds will also be reading Rose's Garden and signing the book from 12 p.m. to 2 p.m. at the JFK Library and Museum. Penguing Pursuit Contest: Three times a charmer! The Edge: Win Tickets to see U2 in IMAX 3D! Free Family Concert - Come sing along!